Greetings from Jewelry 101! I'm taking some jewelry-making classes at a local university. It's something I always wanted to do. True story: I was accepted to an accessories design program for my undergrad, but decided to go with the english degree. 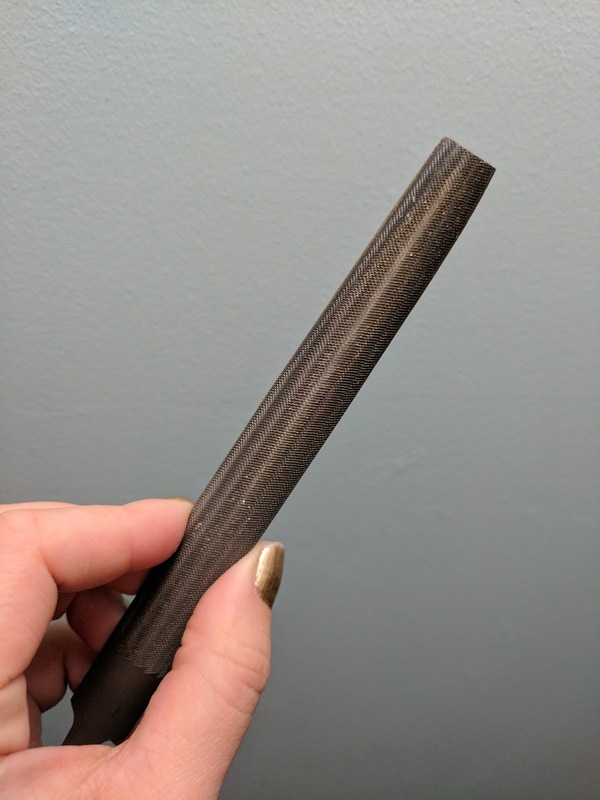 This project was an annealing project, aka heating a metal (with a blow torch) hot enough that you can hammer it into shape. Like the blacksmiths do on TV. Except we didn't hit the metal rod while it was glowing. We dipped it into water until it was cool enough to touch, and then we hammered it into a bracelet shape. I'm pretty sure my lungs are coated in metal dust right now. The metal dust went everywhere. After the filing, we sanded them down with 200 and 400 grit sandpaper, and then finished them on the polishing machine, which also dulled the sharp edges. I kind of liked the sharp edges, but this does look a lot fancier. Plus that was the assignment. It looks like gold! 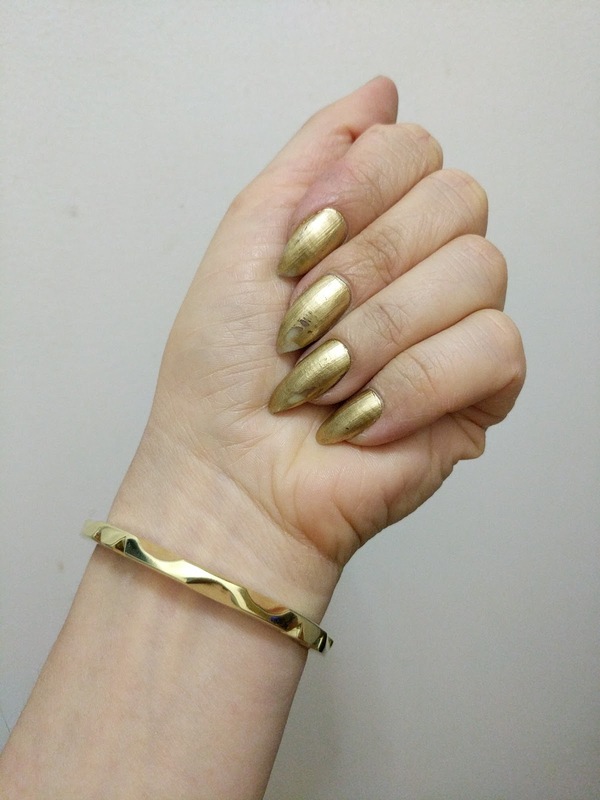 Shown below with my gold nail polish, which I removed patches of while filing my bracelet. Hard to make jewelry when your nails are so long! Obviously, I'm not going to have access to a metal studio forever, but I do think this sort of filing could be applied to wood and bone and other materials that are easier to find. 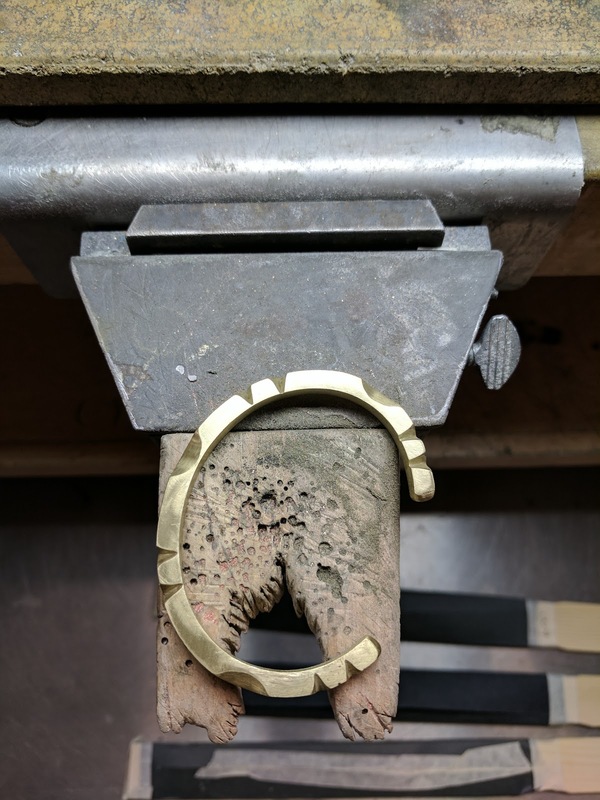 Anyone else take a jewelry-making class? It looks amazing! I'm concerned they didn't make you wear masks! AWESOME! I was actually signed up for some classes a few weeks ago but the instructor got sick or something so they were cancelled. I will be taking some in the summer if they offer them on days I am not working. It looks beautiful, so shiny! I love polishing machines, they're so satisfying! Do you wan to try something with bone? Polishing was definitely my favorite part. I totally want to try stuff with bone.